One In A Million: Zeebers Visits Me in Australia. Episode 1. Zeebers Visits Me in Australia. Episode 1. I travel all over the world and get to meet groovy people who write blogs about me and then send me on my way. I have been in almost 20 states plus Canada. 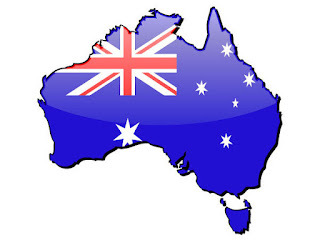 I am currently in Australia after leaving Thailand. Next stop is India! Zeebers has been away from his family Jim and Tina in Tennessee for quite some time. His personal page suggests that he started his internet life on July the 1st 2011. I understand Jim introduced Zeebers into being after he heard about a little bear that many of us hosted by the name of Max. Max unfortunately was lost in the post on his final trip home in the USA and this was such a sad ending for another little international traveller, who also stole the hearts of all who met or hosted him. Zeebers arrived in Australia from Thailand and has been staying with me for about a month now and I must say he and I have been having a ball together. 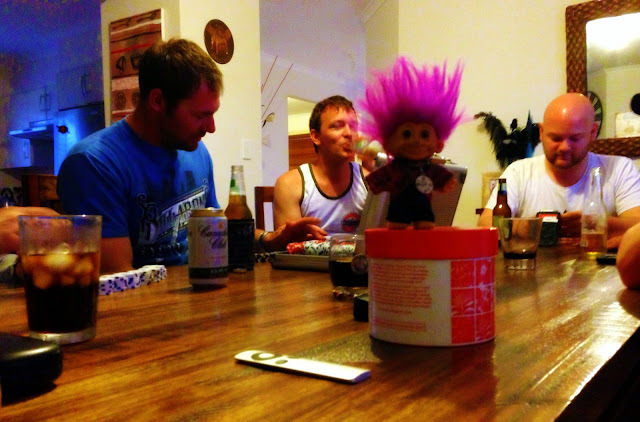 Poker night with the Boys at Jimmy's house. Dexter the Dog could not figure out this little dude with the big pink hair do and the mini skateboard. 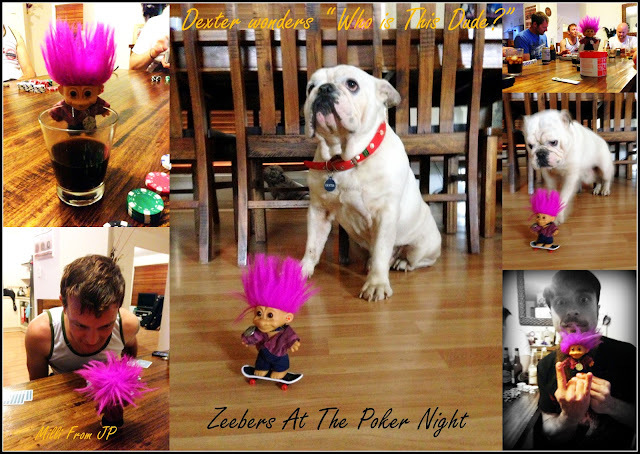 The boys enjoyed his company and even used his poker skills to their advantage. No! No! Zeebers that drink is not yours. LOL. Thanks Jimmy for the photos. 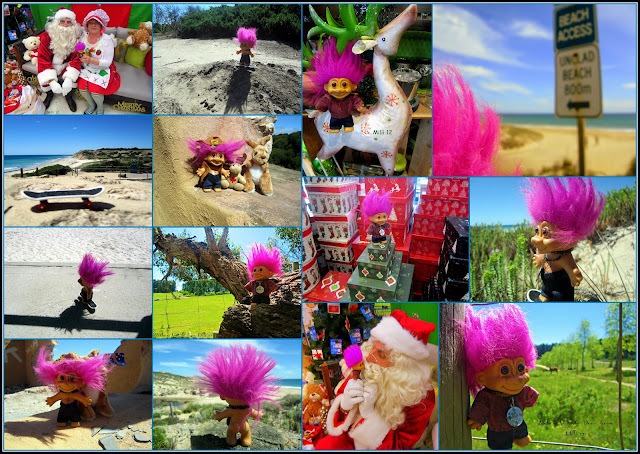 I think a picture speaks volumes and so I have made up a few collages full of some of little Zeebers adventures along with some single shots..
As it is getting close to Christmas in Australia Zeebers visited a deer farm to check out Rudolph's cousins and a fine herd they turned out to be. 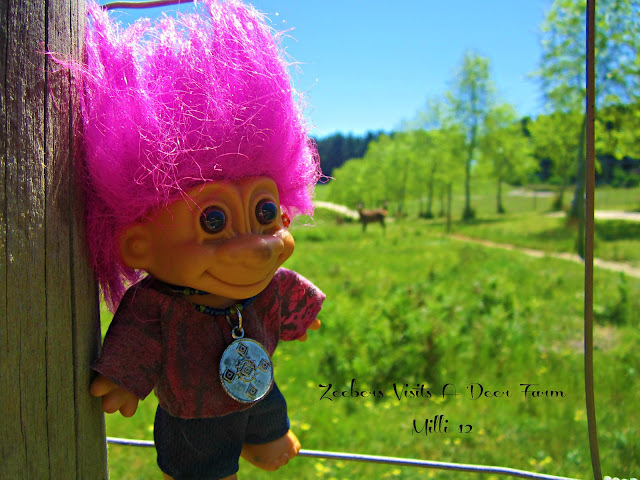 Zeebers also climbed a tree, went to the nudist beach, bearing all, for all to see. He met Mr And Mrs Santa Claus and he asked Mrs Claus if Santa ever Snores. 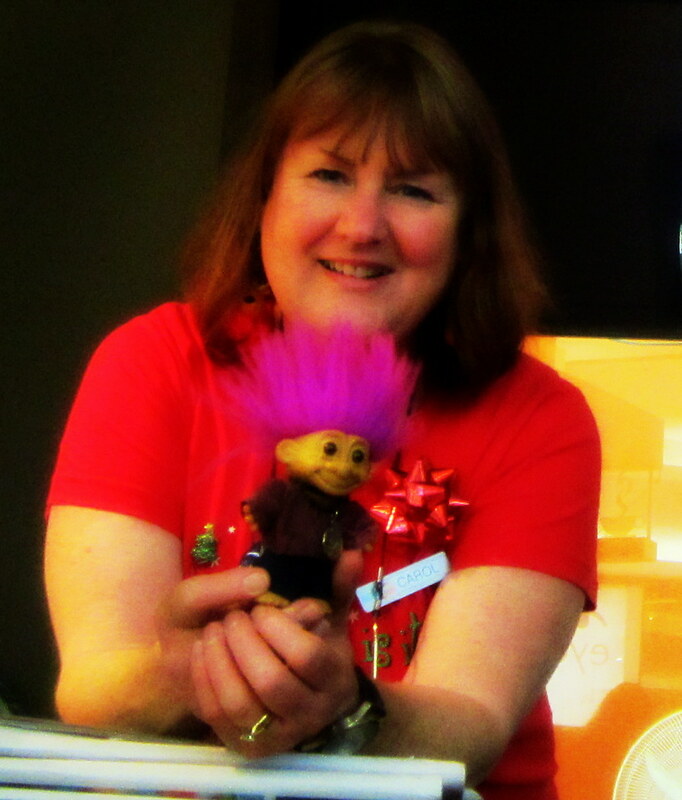 She replied " Santa hardly sleeps this time of the year he is too busy talking to children and pink haired trolls whilst visiting all the stores." Zeebers and Santa Claus get up close and personal. Skateboarding on the promenade and catching up with new found friends of the local kind kept Zeebers happy and in a good frame of mind. There is a surprise for him tomorrow. I hadn't heard about Zeebers til now, looks like he is following in Max's footsteps. It was so sad how Max vanished. I often wonder what happened to him. Forgot to say...the first challenge is now posted on the new Picture This site. Thanks Mitch..I will be over soon. Looks like Zeebers had tons of fun. Cute idea. 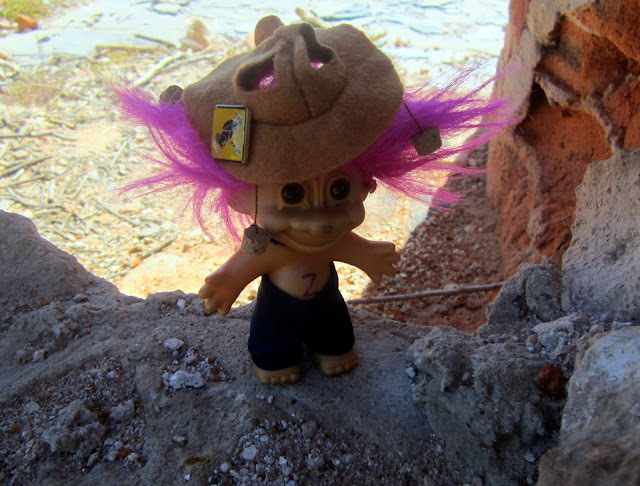 The Little Troll That Could...travel the world around. Thanks Anders and he is!!! Glad that you like T Z.
LOL! I am so tickled. Zeebers, the travelling troll. I like the title. Glad he and you had lots of fun...Enjoy the season Carol. Thanks Dear Sunbeam..it is rather interesting and fun. No lack of fantasy, Millie! :-) Very cute indeed! Fantasy in motion Amalie and having fun too!! How cute is that. I love him with his Aussie hat on. What a fantastic idea too. I bet it brings a lot of pleasure to all as well. LOL now that hat was not easy to find shayna. LOL....it has been my pleasure to host him. Thanks. You have so much fun with things like this. What a neat thing to do. I think it must look that way Lynda but I have only hosted two and both were fun little blogging experiences. Thanks. aaaaaaaaaaaaaawww, how wonderful, how does one sign up to get a visit from Zeebers, I would love to show him South Africa. I do remember Max, in the beginning of my Multiply days, but never had a visit there either. Wonderful post, humorous pictures and such a good idea.